Kornelius Bascombe proposed to his girlfriend of four years Rachel Jordan. One Los Angeles' man's proposal is truly fit for the small screen. Kornelius Bascombe, a television producer for All3Media, took months to plan his proposal to his girlfriend of four years Rachel Jordan. "I wanted to do something crazy and out of control," Bascombe, 27, told ABC News. So he hatched a plan to create a fake photo shoot, overlooking downtown Los Angeles. He even purchased several dresses a month before, just so that Jordan would have the perfect outfits for their shoot. 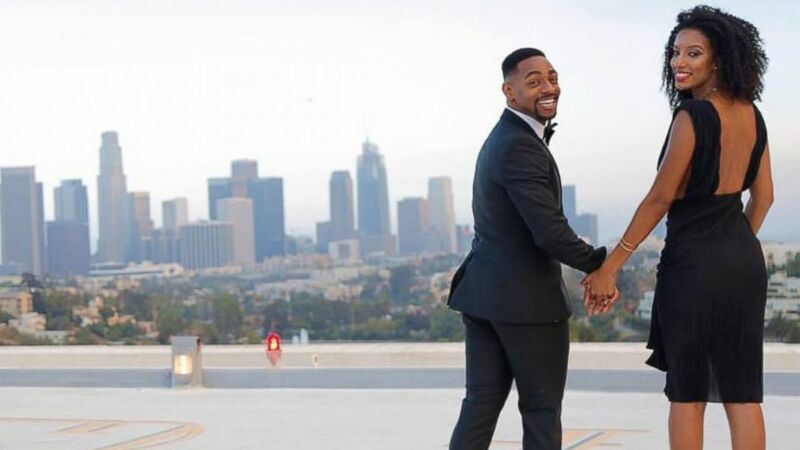 (Myron Visuals/@myronrogan) Kornelius Bascombe, 27, proposed to his girlfriend of four years, Rachel Jordan, 23, with a breathtaking rooftop view in Los Angeles. 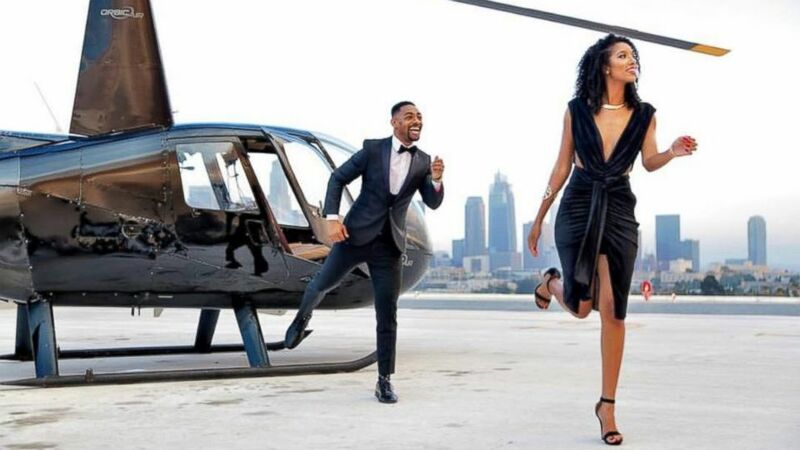 In order to make it "really sleek," he recalled, Bascombe decided to reserve a helicopter ride atop the CitiBank building, so the couple could take a few photos before lift off. 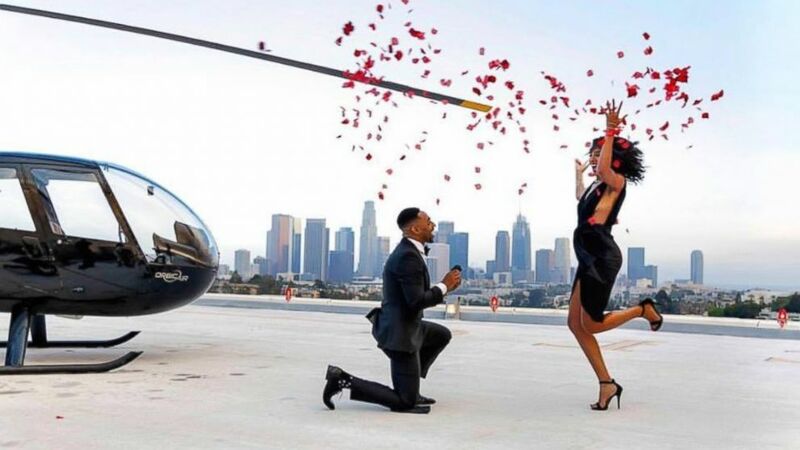 Jordan, 24, was none the wiser as a photographer and videographer filmed the entire thing, including one breathtaking moment when Jordan throws rose petals in the air. "I didn’t sleep at all," Bascombe said of the big day, which was July 23. "She had no idea why I was stressing out the night before. I was just telling her it's because of work." Bascombe, who met Jordan at North Carolina State University in Raleigh, North Carolina, said his heart was racing when he dropped down to one knee. "There was a second when we both were just frozen and shocked," he said. His now fiancée, Jordan agreed. She told ABC News via email, "What he pulled off for the proposal amazes me and I think I'm still in shock." "But the great thing about him is [that] he shows me that level of love everyday," she continued. "He makes me a very lucky woman." The two were so excited that they even forgot to put the ring on Jordan's finger after the bride-to-be said yes. "It was kind of a crazy moment," Bascombe admitted.